Diving into the numbers a bit more, if you took AMD’s second-tier Radeon Instinct MI50 and made a consumer version of the card, the Radeon VII is almost exactly what it would look like. It has the same 60 CU configuration paired with 16GB of HBM2 memory. However the Radeon VII’s boost clock is a bit higher – 1800MHz versus 1746MHz – so AMD is getting the most out of those 60 CUs. Still, it’s important to keep in mind that from a pure FP32 throughput standpoint, the Vega 20 GPU was meant to be more of a sidegrade to Vega 10 than a performance upgrade; on paper the new card only has a 9% compute throughput advantage. So it’s not on compute throughput where Radeon VII’s real winning charm lies. Instead, the biggest difference between the two cards is on the memory backend. Radeon Vega 64 (Vega 10) 2 HBM2 memory channels running at 1.89Gbps each, for a total of 484GB/sec of memory bandwidth. Radeon VII (Vega 20) doubles this and then some to 4 HBM2 memory channels, which also means memory capacity has doubled to 16GB. And then there’s the clockspeed boost on top of this to 2.0Gbps for the HBM2 memory. 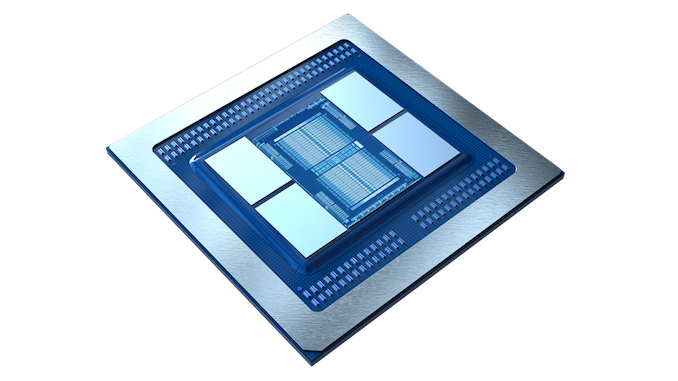 As a result Radeon VII has a lot memory bandwidth to feed itself, from the ROPs to the stream processors. Given these changes and AMD’s performance estimates, I think this lends a lot of evidence to the idea that Vega 10 was underfed – it needed more memory bandwidth keep its various processing blocks working at full potential – but that’s something we’ll save for the eventual review. The other wildcard for the moment is TDP. The MI50 is rated for 300W, and while AMD’s event did not announce a TDP for the card, I fully expect AMD is running the Radeon VII just as hard here, if not a bit harder. Make no mistake: AMD is still having to go well outside the sweet spot on their voltage/frequency curve to hit these high clockspeeds, so AMD isn’t even trying to win the efficiency race. Radeon VII will be more efficient than Radeon Vega 64 – AMD is saying 25% more perf at the same power – but even if AMD hits RTX 2080’s performance numbers, there’s nothing here to indicate that they’ll be able to meet its efficiency. This is another classic AMD play: go all-in on trying to win on the price/performance front. 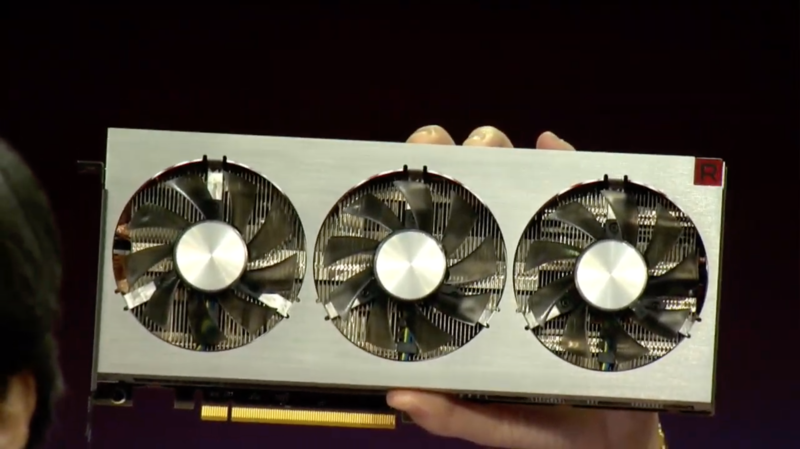 Accordingly, the Radeon VII is not a small card. The photos released show that it’s a sizable open-air triple fan cooled design, with a shroud that sticks up past the top of the I/O bracket. Coupled with the dual 8-pin PCIe power plugs on the rear of the card, and it’s clear AMD intends to remove a lot of heat. Both AMD and NVIDIA have now gone with open-air designs for their high-end cards on this most recent generation, so it’s an interesting development, and one that favors AMD given their typically higher TDPs. Vendor performance claims should always be taken with a grain of salt, but for the moment this is what we have. If AMD manages to reach RTX 2080 performance, then I expect this to be another case of where the two cards are tied on average but are anything but equal; there will be games where AMD falls behind, games where they do tie the RTX 2080, and then even some games they pull ahead in. These scenarios are always the most interesting for reviewers, but they’re also a bit trickier for consumers since it means there’s no clear-cut winner. All told then, the competitive landscape is going to be an interesting one. AMD’s own proposition is actually fairly modest; with a $699 price tag they’re launching at the same price as the RTX 2080, over four months after the RTX 2080. They are presumably not going to be able to match NVIDIA’s energy efficiency, and they won’t have feature parity since AMD doesn’t (yet) have its own DirectX Raytracing (DXR) implementation. But what AMD does have, besides an at least competitive price and presumably competitive performance in today’s games, is a VRAM advantage. Whereas NVIDIA didn’t increase their VRAM amounts between generations, AMD is for this half-generation card, giving them 16GB of VRAM to RTX 2080’s 8GB. Now whether this actually translates into a performance advantage now or in the near future is another matter; AMD has tried this gambit before with the Radeon 390 series, where it didn’t really pay off. On the other hand, the fact that NVIDIA’s VRAM capacities have been stagnant for a generation means that AMD is delivering a capacity increase “on schedule” as opposed to ahead of schedule. So while far from guaranteed, it could work in AMD’s favor. Especially as, given the performance of the card, AMD intends for the Radeon VII to be all-in on 4K gaming, which will push memory consumption higher. Finally on the gaming front, not content to compete on just performance and pricing, AMD will also be competing on gaming bundles. The Radeon VII will be launching with a 3 game bundle, featuring Resident Evil 2, Devil May Cry 5, and The Division 2. NVIDIA of course launched their own Anthem + Battlefield V bundle at the start of this week, so both sides are now employing their complete bags of tricks to attract buyers and to prop up the prices of their cards. Speaking of pricing, perhaps the thing that surprises me the most is that we’re even at this point – with AMD releasing a Vega 20 consumer card. When they first announced Vega 20 back in 2018, they made it very clear it was going to be for the Radeon Instinct series only. That the new features of the Vega 20 GPU were better suited for that market, and more importantly as a relatively large chip (331mm2) for this early in the life of TSMC’s 7nm manufacturing node, yields were going to be poor. So that AMD is able to sell what are admittedly defective/recovered Vega 20s in a $699 card, produce enough of them to meet market demand, and still turn a profit on all of this is a surprising outcome. I simply would not have expected AMD to get a 7nm chip out at consumer prices this soon. All I can say is that either AMD has pulled off a very interesting incident of consumer misdirection, or the competitive landscape has evolved slowly enough that Vega 20 is viable where it otherwise wouldn’t have been. Or perhaps it’s a case of both. Shifting gears for a second, while I’ve focused on gaming thus far, it should be noted that AMD is going after the content creation market with the Radeon VII as well. This is still a Radeon card and not a Radeon Pro card, but as we’ve seen before, AMD has been able to make a successful market out of offering such cards with only a basic level of software developer support. In this case AMD is expecting performance gains similar to the gaming side, with performance improving the more a workload is pixel or memory bandwidth bound. 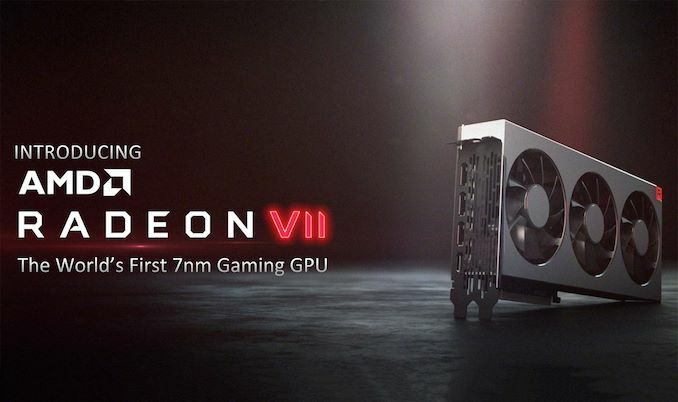 Wrapping things up, the Radeon VII will be hitting the streets on February 7th for $699. At this point AMD has not announced anything about board partners doing custom designs, so it looks like this is going to be a pure reference card launch. As always, stay tuned and we should know a bit more information as we get closer to the video card’s launch date.